One of our own went missing in Toronto on Friday night. 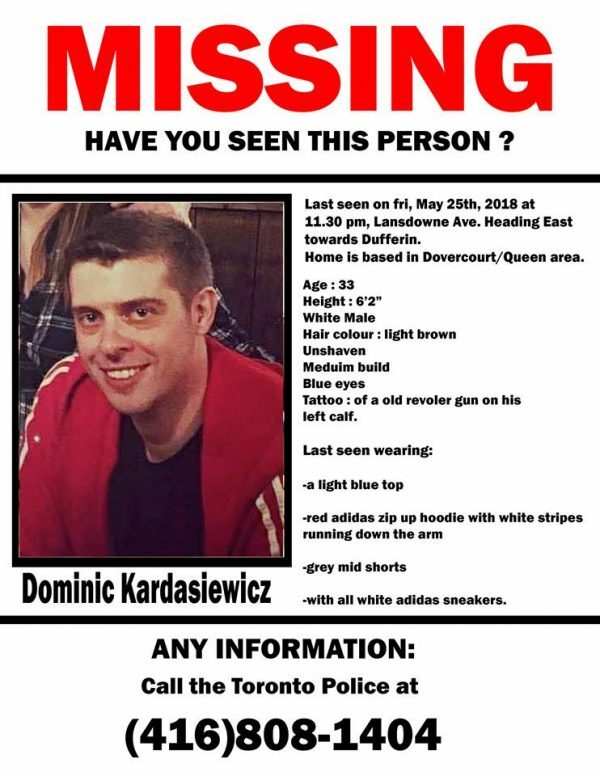 Dominic Kardasiewicz was last seen in Toronto’s west end, around 11:30 pm on May 25th. He was walking home from Bloor and Landsdowne, and was heading east towards Dufferin. Home is Dovercourt and Queen. Dominic worked at Industrial Brothers, and before that he was at Brown Bag Films and Smiley Guy Studios. No one has heard from him in days, and apparently this is very out of character. Please help spread the word. Searches are being organized, and posters are going up all over the area. There’s a Facebook group here where info is being shared and volunteers are coordinating. This entry was posted on Tuesday, May 29th, 2018 at 9:53 am	and is filed under News. You can follow any responses to this entry through the RSS 2.0 feed.